Actually our actions are focused on Madagascar. 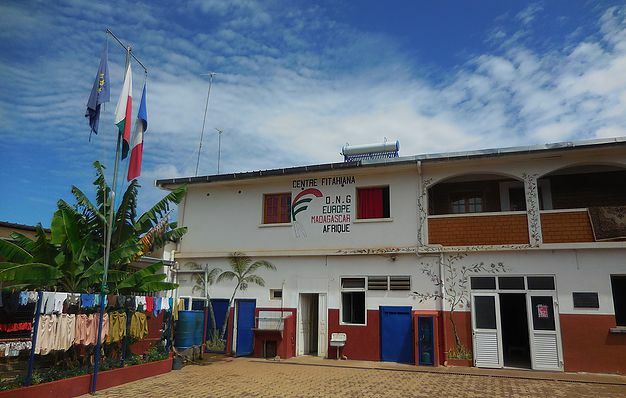 Our branch representaton, Fitahiana center is situated in the nord west subburb of the capital Antananarivo, in the 6th district. We are situated in the district of Avaratanana a neighbourhood of 10.500 inhabitants of which 70% live in abject poverty (source : quarter head). 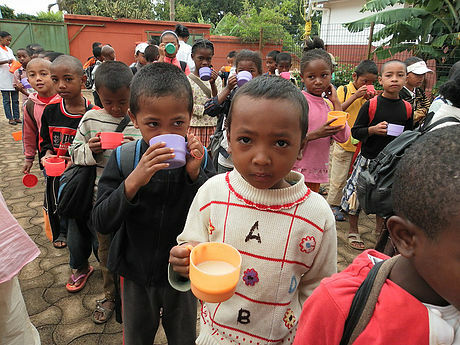 The students undergo the official program of the Ministry of National Education of Madagascar. 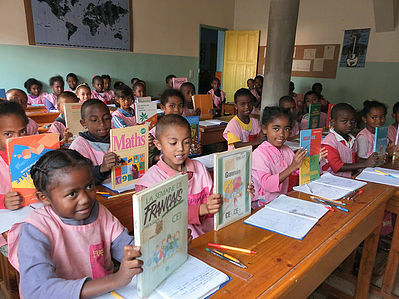 Teaching is done by teachers in malgache and french. At the end of the primary level, children go for the PSCE (Primary School Certificate Examination). This exam is obligatory in order to get into college. From the college, children carry on their studies in external institutions and the fees are taken care of by the N.G.O. After college, the students must pass the SSCE (secondary school certificate examination) to gain admission in to the high school. For those who can’t or do not want to go for further studies, vocational trainings are proposed to them (workshops on mechanics, sewing, computer, bakery and hair dressing, etc…). It can last from 3 months to 3 years. In France, it is possible to integrate a general or technical high school. After 3 years the course is sanctioned by an advance level certificate (baccalaureat). A total financial support until his or her integration in to professional life or till the end of his/her university studies. Each child is monitored individualy by EMA N.G.O, from his/her entry in fitahiana center up to his/her integration in to active life. Every school day, a balanced meal is served to the children and staff, making 350 meals/day. Since most of the children dont have the possibility of eating in the morning, we serve them some maize based pap at their arrival in the center every morning. Persons in the state of severe malnutrition, benefit from our nutitional recovery program. They have access to our refectory, as well as first necessity products (oil, sugar, riz, etc…) and or food supplements on prescription by the center’s doctor. In 2013, 35 persons benefited from this program. EMA-N.G.O have put in place a policy to educate children in matters of hygiene. So, every day they brush their teeth, wash their hands (several times / day), and shower with hot water (once a week). Our doctor and female teachers carry out awareness sessions in this area in the classrooms. Medical examinations are regularly performed in our dispensary. 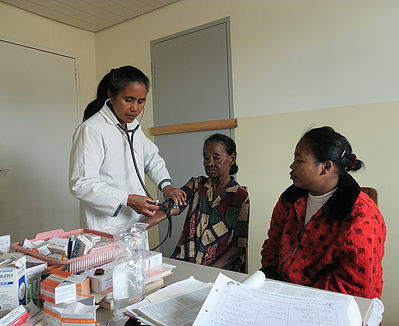 EMA-N.G.O started its activities in Madagascar by medical care, Mme Sonrier our first director being a state nurse by profession. The team have grown with the employment of a medical practitioner and a nurse. The medical office is open 2 times/week, and our doctor assures about fifty consultations weekly. Concerning the treatment room, it is open 3 times/week. Our nurse performs about 20 treatments per day. Both the children of Fitahiana centre and the under privileged of the neighbourhood have free access to our health care. For those patients who are extremely poor, their drugs are free of charge. In case of hospitalisation, EMA-N.G.O takes care of the charges or part of the charges including treatement articles (bandage, cotton, sterile gloves, etc…). Our medical team acts as intermidiary between the N.G.O and the hospitals, and assures postoperative follow up of these patients. The buying of specific drugs is equally in our care. 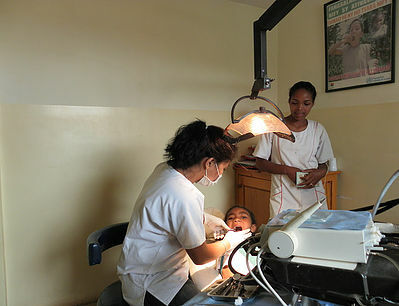 Since september 2008, Fitahiana center’s dental unit is open from monday to Friday. A small participation fee is required about 1 euro per consultation, for the very poor once, 0,33 euro.